Vive Tauron Kielce won the first game of the Polish league finals. Defending champions beat Orlen Wisła Płock 35:29 and took the first step to this season’s championship. Wisła was the first to strike; after a goal of Dmitry Zhitnikov and two fast breaks the guests led 3:0 in the 2. minute. 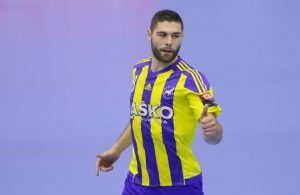 However, Michał Jurecki quickly revived his team by scoring three goals in a row, also by assists and good defending; he was definitely the outstanding player on the court. 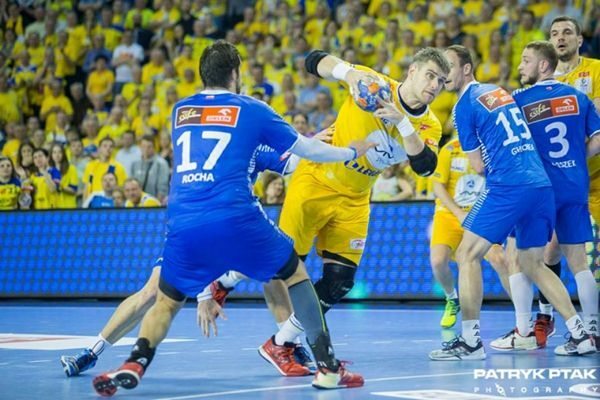 Sławomir Szmal’s saves made it harder for Płock either and in 10. minute Kielce already led by two (7:5). The gap maintained for some time but after 17 minutes of the game, the host team started pushing ahead. Poor performance of Płock at both sides of the court took its toll – 23 conceded goals after 30 minutes and in the end Kielce were even nine goals ahead. Striving Zhitnikov could not do much without a significant help from his teammates and the half time result, 23:14, meant that the first game of the final was probably lost for Wisła. Vive Tauron: Szmal, Sego – Jurecki 8, Reichmann 5/3, Chrapkowski 1, Kus, Aguinagalde 5, Jachlewski 1, Strlek 5/1, Lijewski 4, Paczkowski 1, Zorman 1, Cupić 4/2. Orlen Wisła: Wichary, Corrales – Kwiatkowski, Daszek 4, Pusica 1, Ghionea 4/1, Rocha 7/1, Montoro 1, Tarabochia 3/1, Olkowski, Nikcević 3, Żytnikow 5. In the second half, Kielce for starters made the goal difference even bigger and the 10-goal lead was being kept for some time until Kielce got into a crisis in attack. Four lost balls in a row gave Wisła a chance to cut the gap a little and they took it – they caught up by three goals. In the meantime both goalkeepers managed to help their teams – Marin Šego successfully replaced Szmal and Marcin Wichary improved his previous performance. The final minutes were not too fortunate for Kielce because of the numerous mistakes in attack. Wisła did not avoid them either but they were able to improve their final result a bit despite that. It still wasn’t enough though and they lost the first battle. The second game is taking place on Sunday, again in Kielce.